Troubled singer Amy Winehouse has been rushed to the hospital following a "crazy scene" at her London England home.The rehab hitmaker, was hidden by a red blanket and transported to a waiting ambulance by a wheelchair. London Police arrived at the scene and helped the singer’s frantic father Mitch block the view of crazed paparazzi with a sheet, to prevent the hoardes of snappers from getting a shot of the ailing star. She was taken to the accident and emergency unit of the University College hospital in North West London.The hospital trip comes a day after the troubled singer sparked fresh fears for her health after she was photographed throwing herself to the floor and sobbing during a night out.The singer was on her way to Stables music bar at North London’s famous Proud Galleries in Camden this weekend, when the incident occurred. She was snapped crying and lashing out at her bodyguard in the early hours of Sunday morning before throwing herself on the floor. She was then pictured punching a metal fence in frustration after her minder attempted to pick her up from the ground. A source tells British newspaper the Daily Star, "She was in a terrible state. She left by the back door and went home in tears. She had a black coat over her head and a swollen hand. She looked awful, like her world is falling apart." 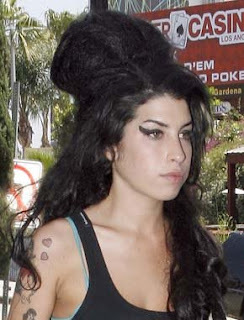 It is time for a change, Amy. Treat yourself well for once.